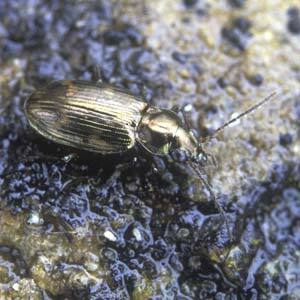 Description: 4-5mm bronze ground beetle. Found in marshes and along riverbanks, also saltmarshes. Only in the southern half. World Distribution: A Eurasian Wide-temperate (65) species distributed across most of Europe except the extreme north, into north Africa and Asia Minor, and east across Siberia to Kamchatka. Irish Status: Mainly coastal in Ireland but confined to southern counties i.e. Dublin to Clare. Ecology: Recorded mainly from fresh or brackish marshes on or near the coast.